I first saw a version of this quotation, with its remarkable attribution, in the program notes accompanying a performance of a choral work that uses the words as its text: Mark Miller’s choir-plus-piano piece “I Believe.” Here’s a video of a good performance of it. Miller’s piece is beautiful, a moving expression of the quotation’s powerful statement of faith proclaimed in a time of despair. And the story behind the words certainly strengthens the emotional effect of the music. A year or so later, I attended a workshop on designing effective worship. The workshop leader mentioned in passing that she had featured Mark Miller’s piece in one of her church’s Advent services. That’s when I first had a feeling that something was a little off. Here we have a story about a Jew’s faith while waiting out the Holocaust in a basement… Was it really appropriate to use this story during Advent, the time when Christians are waiting for the arrival of Christ? It felt to me that even though the identity of the author of those words is unknown, we should still respect their suffering, honor their story, and imagine what their wishes might be. Or is that being too scrupulous? I’m a strong believer in attribution, and in understanding the context in which words were originally written or spoken. But with a story like this one — words found in the aftermath of war — it’s almost certain that there is no documentary evidence that can give us a better idea of the circumstances of the origin of the quotation. I decided to see what I could find. This post is the first in a series of four, in which I will tell you what I have learned. In this first post, I will describe the carelessness with which people have treated the story behind the “I believe in the sun” quotation, and the uncomfortable place that that carelessness leads to. Not surprisingly, the quotation is most often used in religious or inspirational material, so the second post in the series will discuss the Christian history of the words and the story behind them. I found what is likely the earliest printed source of the quotation, but this source points back even further in a tantalizing direction. Furthermore, this early Christian telling complicates matters, because the version of the words on the wall that it gives is different, in an important way, from the quotation as I gave it above. The third post will focus on the amazing history of the first written telling of the story in a Jewish context: as an epigraph to a work of Holocaust fiction that first appeared in a Yiddish newspaper in Buenos Aires in 1946. This early Jewish telling also complicates matters, because the short story to which the quotation is attached completely undermines the apparent message of the quotation. The fourth and final post will talk about how we might still use these words, given what we will have learned about them — and why it is important to care about how we use them. Before we dive in, let me explain the subtitle of this post: “Look away.” This year, Netflix released an adaptation of A Series of Unfortunate Events, the book series by Lemony Snicket nominally written for children. The opening credits of each episode are accompanied by a song that encourages the viewer to look away, because the story will not be a happy one. I feel as though I should give a similar warning: If you like the words and music whose history I will be tracing, and if you would like to keep an uncomplicated view of them, look away. As Thomas Gray writes: where ignorance is bliss, ’tis folly to be wise. But if you are willing to look, let’s begin. When I began to search online for more information about the “I believe in the sun” quotation and the story behind it, I found something striking: There are several different versions of the story. The cellar in Cologne is sometimes the setting, but the details, and the city, and even the time period change from telling to telling. Once the cellar has turned into a prison, there is no need to keep it in Cologne. Tim Baker, in Jesus Is for Liars: A Hypocrite’s Guide to Authenticity (2009), writes of “the Jewish prisoner who wrote these words on the wall of his Auschwitz prison camp” (p. 146). Likewise, Monsignor William McCarthy, in The Conspiracy: An Innocent Priest (2010), writes that the words were “[on] one of the walls of the concentration camp of Auschwitz, Poland” (p. 267). At some point, some tellers of the story must have thought it would be more effective to replace the anonymous writer of the quotation with someone that everyone has heard of. Lenya Heitzig and Penny Pierce Rose, the authors of Pathway to Living Faith (2002), go so far as to attribute the quotation to Anne Frank (p. 263). Still others move the time period forward nearly half a century. Peter Sidebotham, in Growing Up to Be a Child (2014), notes that the words were “allegedly found somewhere in Germany after the fall of the Berlin Wall” (p. 65). The source Mr. Sidebotham cites for this is www.searchquotes.com. I hate to break it to Rev. Kennedy, because it makes his story slightly less poignant, but the Allied Army never liberated the Warsaw ghetto. Hundreds of thousands of Jews from the ghetto had already been shipped to the Treblinka death camp by the time the ghetto was completely destroyed by the Nazis in April and May of 1943. The final destruction was delayed by heroic resistance, but in the end more than 56 thousand Jews who were present at the final battle were either killed on the spot or sent to concentration camps. The seed cast by Rev. Kennedy fell on fertile ground. Lightly modified, the Pulpit Digest version of the story appears on page 74 of Stephen W. Plunkett’s This We Believe: Eight Truths Presbyterians Affirm (2002); on page 279 of Holman Old Testament Commentary Volume 10 – Job (2004), written by Steven Lawson and edited by Max Anders; in chapter 33 of Maxie Dunnam’s3 The Grace-Filled Life: 52 Devotions to Warm Your Heart and Guide Your Path (2010); and in chapter 10 of Dr. David Jeremiah’s The Coming Economic Armageddon: What Bible Prophecy Warns about the New Global Economy (2010). I believe in love, even when feeling it not. — Words scratched on the wall of a cave, next to the body of a Jewish girl who had escaped the Warsaw ghetto. In this relentless progression, we see an ugly aspect of the urge in Christians to retell this story. The words of faith start out as something written by a Jew who survives the war by hiding in a cellar. But apparently the story becomes stronger and the words more significant if we can say that the Jew who wrote the words died in the war — so the story is retold, and now we find the words in a prison cell, or in Auschwitz. But it’s not good enough to have the reader imagine who this Jew might be — after all, we might imagine someone who complicates the story — so next we find out that the author was a girl — an innocent young girl. (One version even specifies that she is 12.) But the story would tug at our hearts even more if the girl had died but had only just missed being rescued — “If only she could have held out a bit longer!” — so we ignore the historical fact of the hundreds of thousands from the Warsaw ghetto who actually died, in order to dramatize the death of our imaginary 12-year-old girl. And finally, finally, we reach the conclusion: the story won’t be good enough, the point won’t be made well enough, the statement of faith won’t move us enough — unless, right there next to the inspirational words on the wall, we see the body of a dead Jewish girl. I don’t think that these changes happened purposefully, intentionally. The problem is more subtle than that. The problem is that many of the people spreading the story did not care about the actual facts. I’m sure if you were to ask them whether they cared about the truth, they would say that they did; but their actions show that they did not care about it enough to go through the trouble of giving a reference or finding a source.4 And sometimes, when they did not bother to check what they half-remembered about a story they had once heard, they changed a detail, or added a bit of color, in a way that made the account better match their unconscious prejudices. And so we end up with E. Carver McGriff’s vision of Jews as innocent; passive; able to flee and hide but not strong enough to fight; long-suffering; and dead. “I believe in the sun, even when it is not shining.” When we tell the story of these words, when we think of the person who wrote them, do we think of an actual person? Do we think of a living, breathing human? A person with strengths and with flaws, someone who has done wrong to others and who has been wronged themself? Someone who has fallen in love, someone whose heart has been broken, someone who has broken the hearts of others? Someone who has sometimes stayed up too late drinking with friends, but who has also done mitzvahs for friends and strangers? Someone with thoughts, and hopes, and dreams? Someone whose life has been ripped apart, whose friends have been killed, whose property has been stolen, and who has been living in a cellar for months? Someone who may have fought on the way to the cellar? Someone who may have supported the resistance? Someone who might care about the words they were inspired to write, and who might care how we use them? Maybe that’s too hard. Maybe it would be easier to erase that actual human, and replace them with an idealized, pure, 12-year-old girl, whose life was cut tragically short, whose faith in God was uncomplicated, and who certainly won’t complain if we use her words for our own purposes. So what do we do, if we want to get closer to the truth of the story behind the “I believe in the sun” quotation? There are so many variations on the story — how can we tell which one to believe? Or indeed, how can we tell whether any of them is true? The first step is to trace back, as best we can, the origin of the story. In the next post in this series, we will go back to London in 1945, and we will hear, surprisingly, the words of a German prisoner of war, as translated by a Quaker woman who was later honored as a British Hero of the Holocaust. Image credit: Annular eclipse “ring of fire” by Kevin Baird. Original here. Reproduced under Creative Commons Attribution-Share Alike 3.0 Unported. We sang those words together just a few minutes ago. I don’t know how familiar most of you are with that hymn, but for some of you that may have been the first time you sang it, or the first time you’ve heard it. The first time I sang that hymn was probably about 10 years ago. At that point I had not been a Unitarian Universalist for very long, but I remember thinking “That hymn is not like most of our hymns.” Our hymnal is full of songs about peace,1 and about reaching out — like Building Bridges, the meditation hymn we just sang. We’ve got hymns about recognizing how other nations are just as beautiful as ours, and have citizens just as patriotic as us.2 We’ve got hymns saying how we are stronger together.3 We’ve got songs of struggle and abiding hope, like We Shall Overcome, which speaks of the peace and freedom we shall one day have, after injustice has been defeated. And even our protest songs highlight our gentleness: Hymn #170 is We Are a Gentle, Angry People. There is good, and there is evil. You have to decide, now, which side you are on. And by the way [says the hymn], most people have chosen evil; the people in power have chosen evil; and choosing good may lead to your death. Those are stong words, and strong thoughts. Where did they come from? How does the hymn fit into Unitarian Universalist history? And how can this good-versus-evil worldview coexist with a Unitarian Universalist commitment to peace and understanding? The easiest of those questions is “Where did these words come from?” It turns out that they came originally from an anti-slavery poem. The 1840s were a contentious time in the United States. For years there had been political arguments about whether and how to annex the Republic of Texas. In 1845, on March 1, Congress passed a joint resolution saying that if Texas acted to meet certain conditions, it could be admitted into the Union as a state. The Republic of Texas took those actions, and on December 29, 1845, President James K. Polk signed legislation that formally admitted Texas into the United States. The resulting border dispute with Mexico was one of the causes of the U.S.–Mexico war of 1846–1848. In the United States, the central conflict about whether to admit Texas to the Union was all about slavery. Texas would be admitted as a state in which slavery was legal, so its admission to the union gave more power to the pro-slavery faction in Congress. The poem is somewhat long: 18 verses of 5 lines each. It begins by saying that when a deed is done for freedom, its effects are felt throughout the world, by everyone; and that likewise, when evil triumphs, that also is felt around the world, because all of humanity is connected in spirit. 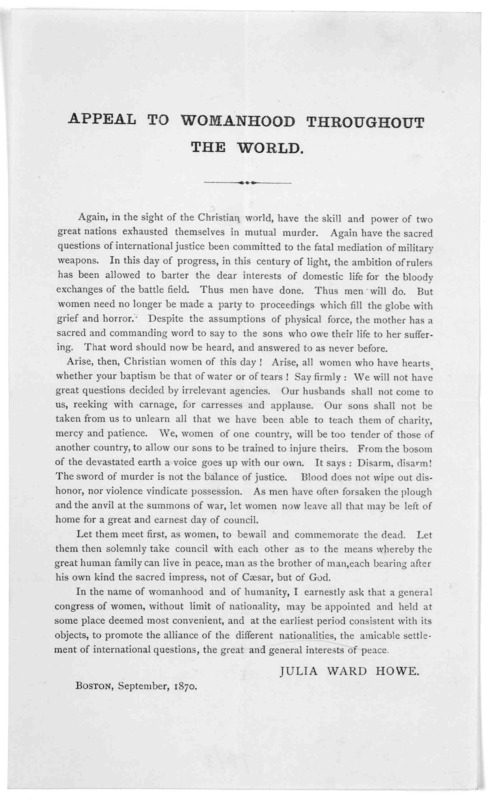 Then Lowell writes the words that open our hymn: “Once to every man and nation, comes the moment to decide.” Lowell says that there comes a time to choose between good and evil, and he asks his countrymen whether they have decided. He writes that when you look back over history, it is easy to see what the momentous issues and choices were, and that it is much harder to distinguish important moments as they are happening. But if you listen to your soul, he says, you will find that the question of slavery is one of those momentous issues, and that conscience calls us to abolish it. In the final few stanzas, he writes that instead of spending our time glorifying the freedom-fighters of the past, we should instead carry their spirit forward, and fight for freedom ourselves. Lowell wrote his poem using mid-nineteenth century poetic language — of course! — and it takes a little effort for a modern reader to untangle the grammar and the allusions. But the ideas he expresses are completely relevant for today. For example, consider the idea that it’s much easier to tell after the fact what was important, and who was right. And consider, to be specific, the legacy of Martin Luther King, Jr. Over the years, the Gallup organization has done several surveys in which they ask Americans for their opinion of Dr. King. I think you will not be surprised to find that in August 2011, 94% of Americans had a favorable view of Dr. King. In fact, 69% of Americans had a highly favorable view of him, versus only 1% with a highly unfavorable view. So looking back, nearly a half-century after his death, we see Martin Luther King, Jr. as a prophet; a prophet who asked America to live up to its ideals; a prophet who stood for good when it was hard to do so. But what about back then? In August 1966, Gallop asked the same question. And you might expect me now to tell you that Dr. King was a divisive figure in 1966. But you know, he wasn’t divisive. Because Americans mostly agreed; with a nearly two-to-one ratio, Americans had an unfavorable view of him. And nearly half the country — 44% — had a highly unfavorable view of him. 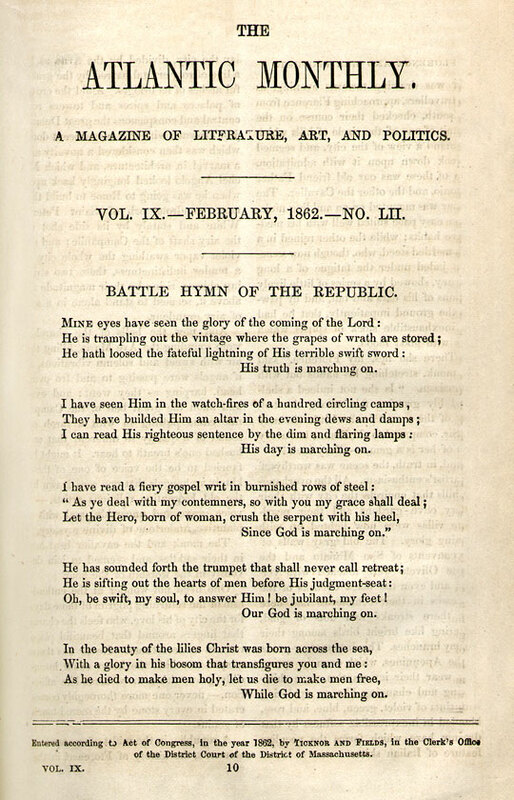 Lowell’s poem was reprinted in other progressive newpapers in the weeks after its first appearance,6 but over the next few decades the complete poem was reprinted only now and then. However, one particular stanza got quoted a lot: the one that begins “Once to every man and nation comes the moment to decide…”. And in 1880, three Unitarian ministers took three stanzas of Lowell’s poem — including that one — edited them down to four lines each instead of five, and published them in a hymnal7 mostly used in the Western Unitarian Conference. Keeping watch above his own! So. That’s one way of looking at the world. But our meditation hymn gives another way. What does it say? I reach out to you, will you reach out to me? Friends, we could make such sweet harmony. This song came from the early years of the Greenham Common Women’s Peace Camp, an anti-war protest in England that lasted from 1982 until 2000, originally motivated by the arrival of cruise missiles at an air force base there. The words suggest a different way of effecting change — of working with people you disagree with. What are the strengths and weaknesses of these two approaches to changing the world — the good-versus-evil, no-compromise approach, and the building bridges approach? The good-versus-evil approach of Once to Every Soul and Nation provides a very clear sense of purpose: You know what you stand for, and you know that you will not compromise. This clarity can get people to take action, to get off their couches and into the streets. But it has weaknesses too. For one thing, movements based on this good-and-evil worldview can degenerate into exercises in purity. People can be excluded from leadership if they show any sympathy for positions held by the other side. The good-and-evil worldview tends not to admit doubt, and it can lead to a form of self-delusion: Because we are extreme and unpopular, we must be right. In the end, both sides of the argument can end up holding the most extreme versions of their positions, and moderates are forced out. And if your side accepts no compromises, and the other side accepts no compromises, and you both have moved towards exteme positions… Then what?9 You’ll either have a stalemate, or you will have to fight. And it’s easy to think that, OK, we’ll fight, and maybe our side will win, but then the question will be decided and then everything will be set right. But it’s easy to underestimate the cost of the fight, and to overestimate the extent of the eventual victory. Here’s an enlightening example of someone who changed her mind about the good-versus-evil approach. That transfigures you and me. “As He died to make men holy, let us die to make men free.” In 1861 that was not just a figure of speech! It makes me think: Going to church in the nineteenth century must have been intense. Arise, all women who have hearts[…]! Say firmly: […] Our husbands shall not come to us, reeking with carnage, for caresses and applause. Our sons shall not be taken from us to unlearn all that we have been able to teach them of charity, mercy and patience. […] From the bosom of the devastated earth a voice goes up with our own. It says: Disarm, disarm! What happened in the nine years between “As He died to make men holy, let us die to make men free” and “Disarm!”? What made her change her mind? Well, for one thing over a million people were killed in the civil war, more Americans than have been killed in all our other wars combined. That’s not to say that slavery wasn’t worth fighting over; it’s just to say that wars often end up being worse than we imagine — a lesson we apparently have still not learned. So those are some strengths and weaknesses of the good-versus-evil approach. What about the Building Bridges approach? What about an approach that works within an existing system, and uses compromise? One of the strengths is that progress can come slowly but regularly. The possibility of reconciliation between the two sides is left open. People on both sides of a question can learn to trust one another through small actions; they can find common ground, and then work outward to solve larger problems. But there are weaknesses too. For one thing, compromise only works if both sides are willing to do it. And a commitment to working within the system can lead to complacency; it’s the apocryphal “frog in a pot of warm water” problem. Just as the frog does not notice the temperature rising, you may become so entrenched in the system that you can’t see how broken it has become. I think we’ve answered the second question I asked at the beginning — how this hymn fits into Unitarian Universalist history. What about the third question? How does the good-versus-evil worldview of Once to Every Soul and Nation fit in with Unitarian Universalist values? ▸ The prophetic good-versus-evil approach works best in combination with working within the system, and finding compromises. Civil rights legislation was passed because of the public pressure of the civil rights marches and protests. But while the marchers were marching, people were preparing the legislation that was needed to push the nation forward. ▸ I think that our Unitarian Universalist values demand that when we take a prophetic good-versus-evil approach, we need to at least be aware of the risks and downsides of that approach. Here is my request of you: Throughout the week, reflect — In what situations do you try to work within the system to fix things bit by bit, and in what situations do you say the system is broken and work to replace it? Do you tend to do one more than the other? What does that say about you? A few months ago I asked a version of this question of my congressional representative. “How do you decide when to work across the aisle and compromise, and when to hold fast to a principle?” What would your member of congress say? What would you want them to say? Once to every soul and nation comes the moment to decide, in the strife of truth with falsehood, for the good or evil side. And I hope that you will let that question stir you to action — thoughtfully, responsibly, powerfully — as a Unitarian Universalist. Image credit: Our Banner in the Sky, by Frederic Edwin Church. More information here. Later this week, I will be heading off to Wisconsin for the annual conference of the Unitarian Universalist Musicians Network, where hundreds of church music directors, instrumentalists, singers, and composers will gather to learn new music, to educate ourselves in best practices, to increase our skills, and to provide choral music for Sunday services at our host church, the First Unitarian Society of Madison. This year it will be especially exciting for me, because one of my pieces was chosen for the choral music reading session. In keeping with the week’s theme, I thought that I would post something today about music. But it’s not just about music — it’s also about the mementos we leave behind us, about the things we will never know about one another, and about the secret histories of our thoughts. And here’s a video of a good interpretation of the song (with instruments), performed by the Dedalus Ensemble. The director of our group had learned this song orally, so the first few times we rehearsed the song we did not even know its composer or its history. But a little research showed that it was written by an interesting character named Moondog (born Louis Hardin). His Wikipedia entry tells you the basics, but this longer biographical piece fleshes out his life a little more. (d) a street musician who, late in life, played in the courts of European royalty? So now my a cappella group knew where the unusual round we were singing came from. But still I wondered: How did this song come to be? How did these unusual lyrics wind up in Moondog’s head? Moondog died in 1999, so unless someone had interviewed him and asked this specific question, there would be no real way of finding out for sure. But perhaps the source could be traced a little further back. First, some history. According to Seneca3 and Pliny the Elder4, the emperor Nero did send an expedition to find the source of the Nile and to explore the lands around the river, and Seneca even mentions that the waters become completely unpassable at a certain point, due to the masses of vegetation. However — and this is important — the vegetation could not have been water hyacinth. The water hyacinth is native to South America, and it was not introduced into Africa until the 19th century.5 It did not become a problem on the White Nile until the 1950s. So Nero’s expedition may have turned back because of vegetation, but not because of water hyacinth. Moondog got his history wrong. I became perhaps just a little obsessed with finding some article or book that could have led Moondog to think about Nero’s expedition to find the source of the Nile. And now I knew that if such an article existed, it most likely would have been written after the late 1950’s, and it must have somehow been unclear in its description of the natural history of the water hyacinth in Africa. “Nero’s Expedition” appears as round #12 in Book 1 of Moondog’s 1970 booklet Round the World of Sound: Moondog Madrigals. I obtained a copy of this booklet, hoping that it might include some commentary explaining how it happened that Moondog was pondering the failure of Nero’s expedition. Unfortunately, the only annotation to the piece was a date: it was written on June 23, 1968. But that at least gave me a firm ending date for the publication of my hypothetical article. It turns out that there are quite a few articles about the Nile written between the late 1950’s and 1968. I’ve read a lot of them. And almost all of them either do not mention water hyacinths at all, or make it quite clear that they had arrived on the Nile only recently. The Emporer Nero sent two centurions with an expedition into the wastes of Nubia, as the Sudan was then called, but they returned unsuccessful, saying that they had been blocked in the far interior by an impenetrable swamp. This is somewhat promising, in that both Nero and the water hyacinth are mentioned in the same book, but the number of pages between the references, and the fact that it is made quite clear that there were no water hyacinths in the Nile during Nero’s time, make it seem unlikely that this is the proximate source of Moondog’s lyrics. Samual Baker gives a fine idea of what the Sudd was like when he saw it in 1870, the stream being then completely blocked. He says, “The immense number of floating islands which are constantly passing down the stream of the White Nile had no exit; thus they were sucked under the original obstruction by the force of the stream, which passed through some mysterious channel until the subterranean passage became choked with a wondrous accumulation of vegetable matter. The entire river became a marsh, beneath which, by the great pressure of water, the stream oozed through innumerable small channels. In fact, the White Nile had disappeared.” This was the obstacle that for a good two thousand years blocked every attempt to get to the source of the river. Two centurions sent by the emperor Nero were forced to turn back, and between that time and the nineteenth century numberless unsuccessful expeditions set out. In the Sudd, the Nile cabbages vanish—perhaps they are broken up by the rapids above Juba—but they are replaced by the water hyacinth, which is even more prolific. It is a green, fleshy creeper with a pale-purple flower, and it reaches out, floating, from the bank. Long filaments of the plant constantly break away and sail off down the river. We kept smashing into these green rafts, and although they were torn to pieces by the paddles, they always gathered themselves together again in our wake. Nowhere in this article does Moorehead mention that the water hyacinths are a new feature in the Nile, and the reader has no reason not to believe that the “wondrous accumulation of vegetable matter” that forced Nero’s centurions to turn back was not formed by the water hyacinth. So, there we are. An article from 1958, and an enigmatic round from a decade later. Is there really a connection between the two? Moondog was blind; any link between him and Moorehead’s article must include at least one further step, a person who had read the article and talked about it. On the other hand, in 1968 the idea of an imperial expedition into a foreign land being turned back by an abundance of flowers would surely have struck a countercultural chord. But it is probably unrealistic to hope to find an explicit link between Moorehead’s article and Moondog’s round. Like Nero’s centurions, we can go no farther; the source we are seeking is, as was theirs, a distant rumor in a land not our own. We can only turn our boats towards home, and wonder. Cover photo: “Kenya — Lake Victoria” by Global Environment Facility, shared under CC BY-NC-SA 2.0. Original here. I might have used this photo instead, but I don’t have permission. Copyright law is complicated, and makes things complicated. In 2012, the lead minister of my congregation (the First Unitarian Universalist Church of San Diego) wanted to have a service that incorporated the music of Bob Dylan. The director of the JUUL Tones, the a-cappella group I sing with, wanted to perform The Times They Are a-Changin’, but could not find an SATB or SAB arrangement of it. I composed an arrangement (and wrote it down, which may have been illegal, depending on how strictly you read copyright law), and contacted Bob Dylan’s Special Rider Music, which owns the copyright to the piece, at the phone number listed on their SESAC page. The woman who I talked with was very polite, and when I explained that I wanted to perform an arrangement of The Times They Are a-Changin’ for a church service, she said to just go ahead, with perhaps a slight tone of “why are you bothering me with this?” in her voice. A couple of years later, when our lead minister was going to retire, our a-cappella group wanted to sing the song again at his farewell gathering. This time we would not be covered by the religious service exemption, so I called Special Rider Music again, and then got in touch by email with Will Schwartz, one of the people there. He said that for this piece “there’s no license for performance rights. [Y]ou can go ahead and perform.” If we wanted to record a performance, we would have to pay a statutory rate of 9.1 cents per distributed copy, but he said we could make the recording and contact him afterwards. So we were clear to sing the piece at the farewell gathering. But I was also interested in making the sheet music available to other musicians, in case anyone else would like to sing an a-cappella version of The Times…. I asked Mr. Schwartz about this, and he said to contact Kevin McGee at Music Sales Corporation. The powers that be in the music world seem to find a request to distribute sheet music to be unusual. I submitted a permissions request, and when Music Sales Corporation finally got back to me (after 10 months and two followup emails), they sent me a proposed license to perform and record the piece, with permission to create 10 copies of the sheet music to be distributed to the members of the JUUL Tones. This was not at all what I asked for, or was hoping to get. Fortunately, Duron Bentley, the colleague of Kevin McGee’s who I was now in touch with, kindly and patiently kept up the conversation as I tried to explain what it was I was hoping to do. Initially, he said that they would not be able to modify the license to let me print out more than 10 copies of the music, and he suggested that if another group wanted the music, they should contact him to obtain a license. This arrangement may not be duplicated, promoted, sold or otherwise made available to any third party. This includes all recordings, social media, personal websites, YouTube and the like. Performance is permitted only during a religious service. Please contact Music Sales Corporation for permission to create an arrangement. This arrangement may not be duplicated, promoted, sold or otherwise made available to any third party without further permission from the publisher, Special Rider Music. This includes all recordings, social media, personal websites, YouTube and the like. Please contact Music Sales Corporation for permission to create an arrangement. That seems reasonable enough. I preface the notice by saying “I have to put this notice here,” and suggest that people consult copyright attorneys to determine their rights. Also, I mention that Special Rider Music does not require further license for live performances. So, in the end? I think I did everything in accordance with copyright law. It took a year of waiting, and some persistence, and $275 for the general license plus $1.50 for each copy I print, but… I did everything in accordance with copyright law. Perhaps this was a little silly, because there’s no indication that anyone wants this sheet music, but I thought it would be an interesting experiment to try. Besides, this way I won’t feel guilty about depriving Bob Dylan of his retirement income. Interested in seeing the music? That would make me happy. Please get in touch with me. Photo credit: Rowland Scherman. The image is in the public domain, and is part of the U.S. National Archives. More information here.